While Christmas is (only) 57 days away (!!) I can't help but get excited for this holiday season. 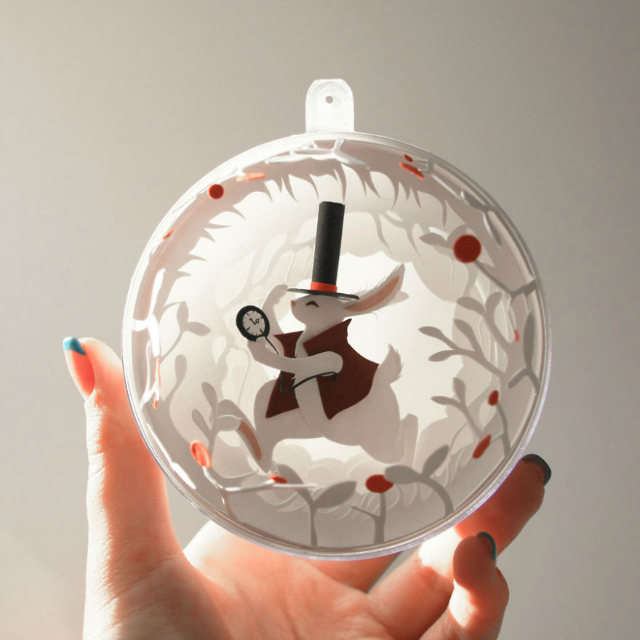 After seeing these Alice in Wonderland inspired ornaments, I'm even more excited to start gathering the decorations and perhaps find some unique designs along the way. Adamova Marina is a Russian illustrator and graphic designer. 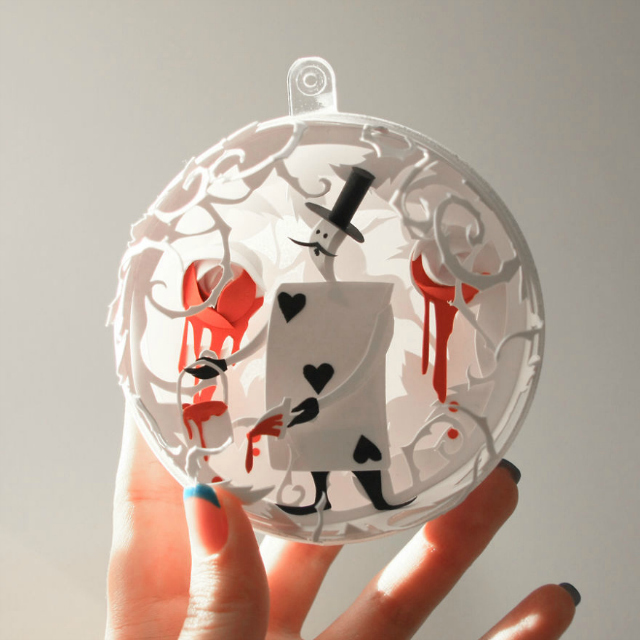 But, she refers herself as a (self taught) paper artist after she first started her Alice in Wonderland paper series two years ago. She realized the series coincided the three things she liked most: using a sharp knife, finding secondary meaning in fairy tales and symbolism in illustration. 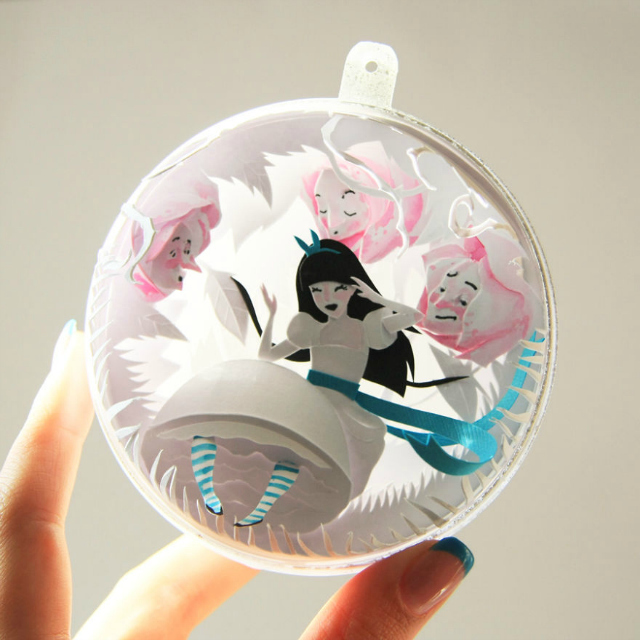 Two years and numerous paper art projects later, Alice's tale and adventures remains a source of inspiration so she decided to incorporate the paper art into ornaments. The most magical element comes when the light shines through the ornaments and makes the images seem alive with the play on shadows. 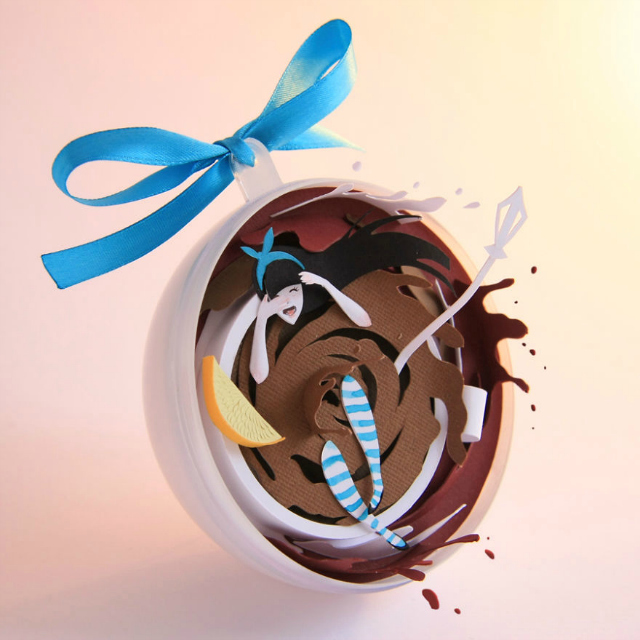 The critical attention to detail and intricate layers of paper create visually stunning pieces of art. With a story as familiar as Alice in Wonderland, it's satisfying to see the story come to life in a new way. At the end of November, her work will be exhibited in Norway for the Oslo Pop Up exhibition. You can see more of her work via her Instagram, too. Love this, makes me so excited for Christmas! Wow! These are wonderful! So intricate and detailed. Just looking at these totally put a smile on my face. 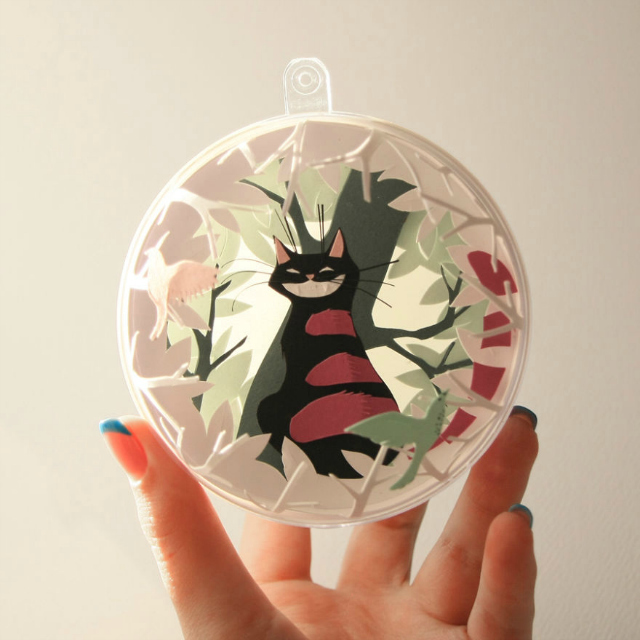 These ornaments are just so whimsical and fun not to mention beautifully crafted. I would love to be able to see Adamova's work in person! Holy crap, these are amazing!! Wow. Super cool~~~ i wanr all of them. These are amazingly detailed, so creative and unique! I really enjoyed this post. It was so warm today in NY, it seems that Christmas can't possibly been that soon! I hope you and your family are well! Omg!! 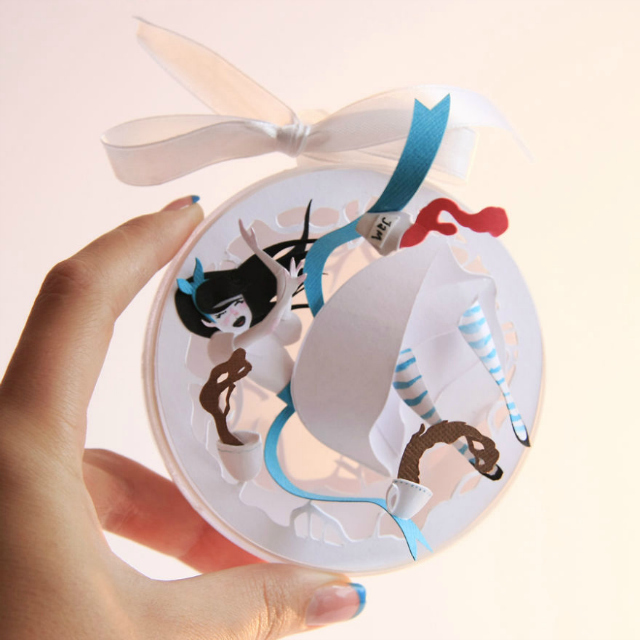 This is so cute and so cool!! I've never seen anything like this!!! 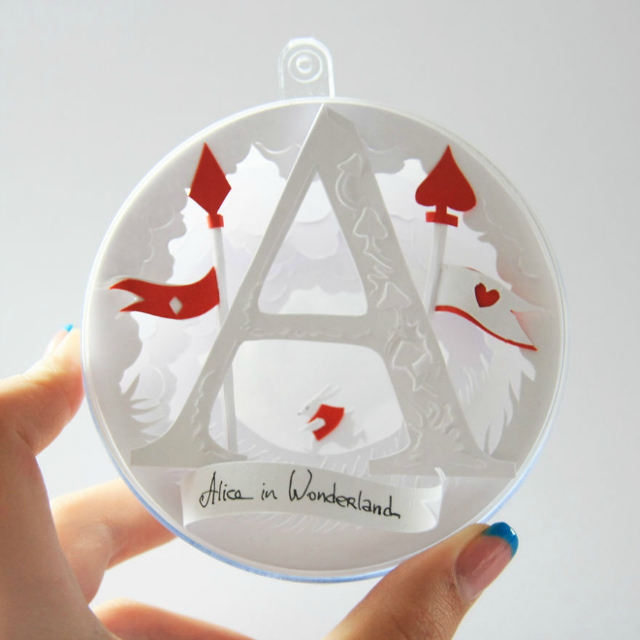 I love Alilce in Wonderland! These are so dreamy!